As the winter that wasn’t turns to the spring that shall be, cyclists are hitting the road again. 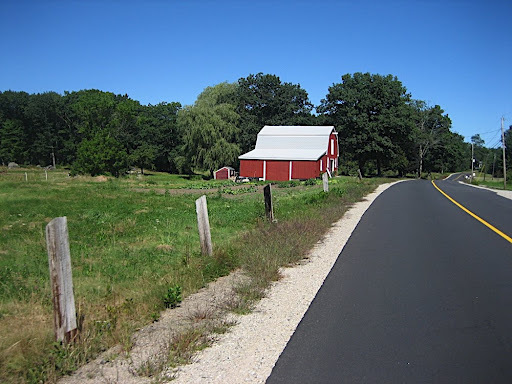 Members of the Saco River Cycling Club started their weekly group rides this week and they are looking forward to another long season of riding. For more than 15 years the club has met behind Michael’s Pizza on Wednesday nights and from the parking lot they head out for a 15 to 30 mile ride. For most of those years Phil Gendron and Dave Freeman have led those rides and this year is no exception. The group has changed over the years as new members have come and gone, but one constant has remained – the idea that the group is more important than any individual rider. The club has a long-standing tradition of making sure that riders of all ability are welcome and no one is left behind. This year, on what seemed like an unseasonably cold afternoon, five hardy riders started the season again. All of them expressed the wish that more would join them soon. If you are looking for a group ride, the club can be found behind Michael’s Pizza every Wednesday night from now until late October.